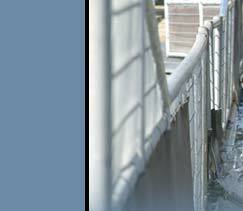 The Model 1000 is our premier horse treadmill system, incorporating the best features and options available. 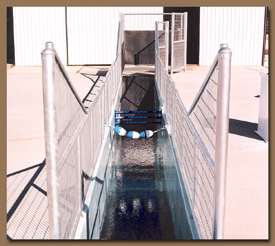 The HydroHorse Inc. Treadmill offers easy and convenient entrance and exit of the unit and after just a few workouts on the system, horses soon lose their fear of being ‘herded’ into an enclosed area which then facilitates loading them onto their travel trailers for transportation. The specially designed Control Panel leaves the operator in complete control of the unit at all times; including monitoring the belt speed which can go from 0 to 11 mph. The ‘controlled’ environment of the treadmill system allows constant monitoring of the animal during therapy and workout while requiring minimal supervision. The Model 1000 'Superior' is a larger version of the Model 201. It has a 12 foot treadmill as opposed to the standard 10 foot of the Model 201. 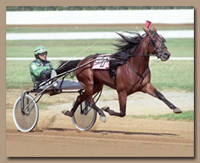 This longer treadmill allows more room for a horse to move while on the treadmill. The Model 1000 also has a higher output (20HP - 3 Phase) motor to drive the longer belt. The Model 1000 also includes the 'Golden Green Entry System' to help horses access the system easier (an option on the Model 101A, and 201). A tri-Filter system also comes standard on the Model 1000 as opposed to the standard Twin-Filter system of the Model 101A and Model 201. Please contact us for information on coordinated pricing for the Model 1000 Superior. Coordinated pricing provides all the equipment, blueprints, and instructions for you to set-up the system yourself. HydroHorse Inc. can provide complete installation as well, please Contact Us for pricing on complete installation as pricing will vary depending on where you are located. 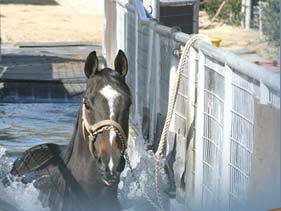 The HydroHorse Inc. Treadmill system features easy maintenance. All units are custom designed and built to fit individual needs, from single units to multi-unit treadmills. Manufacturers warranty on all pumps and fittings. One year Warranty on all other parts.